One of my favorite looks for summer … crochet tops and cardigans. I love the beachy boho vibe! But first of all, how cute are my photobombers? I’m still wearing my ortho shoe, but I hobbled around in real shoes just for pics. Love this H&M cardi with flared jeans, summer sandals, and a pretty lace scarf. I look so cute, Rox wanted to make out with me! How ready am I for summer? Summer begins for teachers when we turn in grades and keys. For me that was today! Found this cool crochet top for a steal at Ross. Also wearing Old Navy distressed skinnies and Seychelles sandals. The sun hat is from Coolibar, a great website to go to for all things sun protection. Sunnies by Ralph Lauren. And how about one evening date night look? Just right for a dining al fresco by the shore! 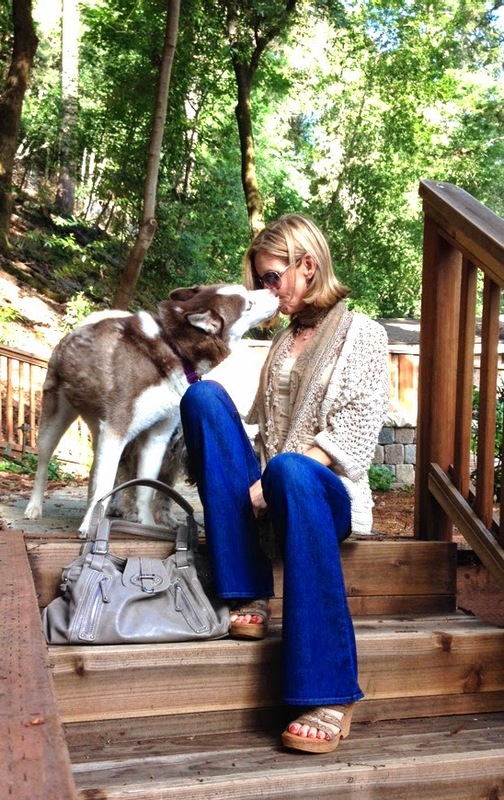 Kika ponte knit pants, Carlos Santana bag, and Style & Co top. If I’m starting to look a bit disgruntled, this is about the time my darn broken toe started throbbing, reminding me to put my medical shoe back on. And that’s all for today, Dolls. Looking forward to a summer with more time to check out all your fab blogs! Check out this month’s HIWM round up with Adrienne of Rich Life on a Budget and Jill of Everything Just So! 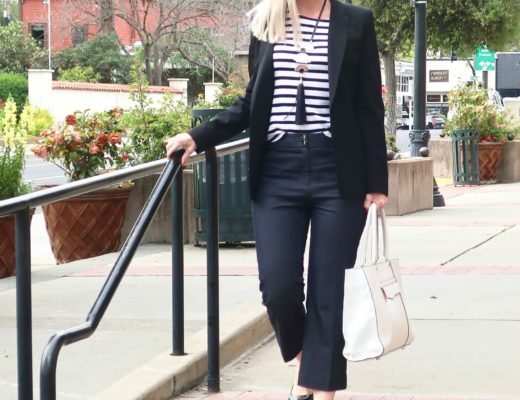 Linking up with What I Wore Wednesday! 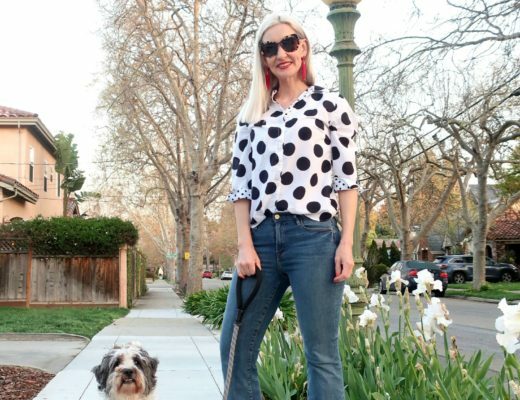 Linking up with Renae for Fashion Item Friday! Linking up with Rachel the Hat! Linking up with Patti for Visible Monday! Fabulous ensembles here Dawn Lucy! I love the bag in the first outfit, the hat and lace top in the next (and the doggie photo bombing, too) Thanks for joining Fashion item Friday, so faithfully! I appreciate it so much! Aww thanks Renae! I love being a part of the fun and fab gang on Fashion Item Friday! Thanks for including me, dear. Great tops! I never wear these kind of tops but I love how modern they look with your other pieces like your jeans. Especially like your look with the distressed skinnies as well as the all black outfit. Thanks so much, Sylvia. Loving your blog so much! I agree, fun boho vibe! Love your photobomers. 🙂 Thanks for linking up! I had fun co-hosting with Renae! Thanks so much for stopping by, Amy Ann! A fabulous trio of outfits and a great way to celebrate the begiinning of Summer..You have a sophisticated boho vibe goiing on here!!! Oooo .. I love that description … "sophisticated boho" …. thanks so much for that! Lucy looks so cute!!!!! Great outfits!!! 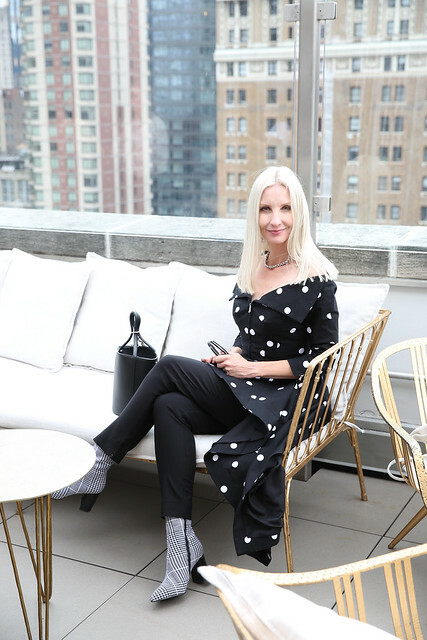 Loving your total black! Aww … you're way too sweet, but thanks for making my day. Gorgeous! And the photobombs are wonderful. Those jeans are so perfect with your wedges! And I love that crocheted top! It's really pretty with the mint underneath. Love, love, love that backyard!! Wow! Aww thanks! I love our little cabin in the woods. You're so sweet. We would have so much fun shopping together, Monika! And yes, off until August! WOOHOO! That top from Ross is pretty sweet. The hint of mint with the cami is great too. You have the perfect deck and yard for taking photos! Thanks so much for stopping by, Suzanne! My yard is a pretty good place to run around taking timer cam pics with my iPhone … lots of places to prop up the phone … and lots of privacy so the neighbors can't see my silly poses! Fabulous looks, Dawn Lucy! Only yesterday I looked at some crochet cardigans at H&M… after seeing your stylings I better return there sooner than later! Especially love the 70ies inspired styling but also the all black. Aww .. it's hard to have chilly weather when you're in the mood for summer. But where you live always looks so beautiful! I do love that 70's vibe! Thanks so much for the comments, Annette! 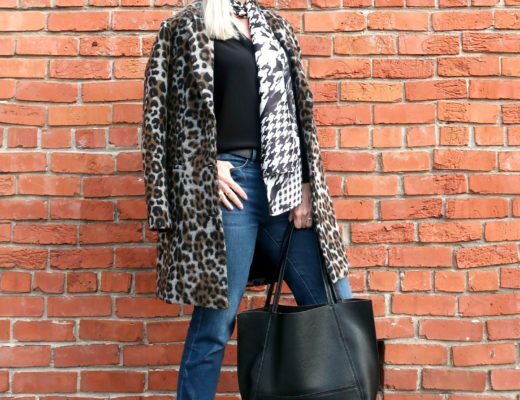 Love your blog & love your style! Aren't you the sweetest? Thanks, Tina! 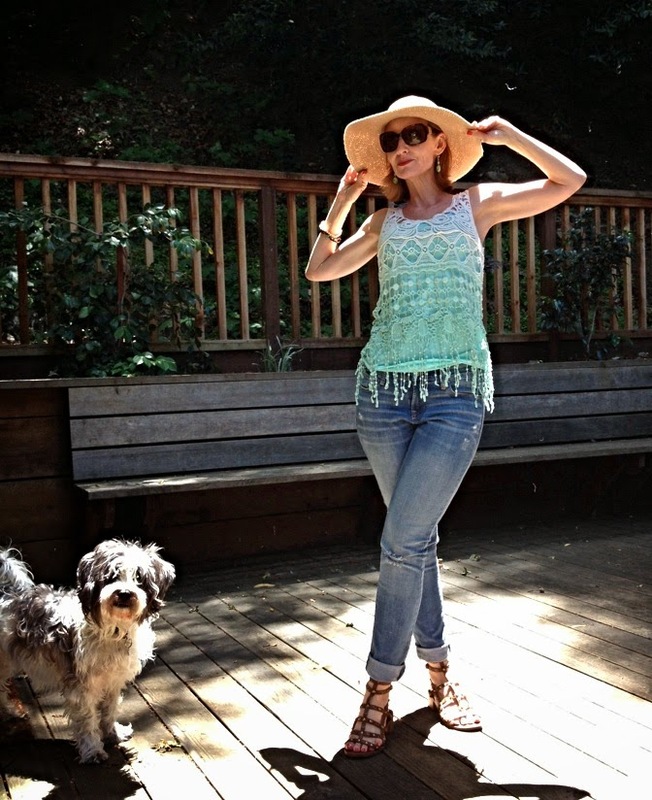 Loving your long and lean figure Dawn Lucy….and you are nailing the boho look with those stuff!! Well, thanks so much, Rebecca! How sweet are you? Loving redtagchicLA! Cute looks! Love the wide legged jeans on you. Very flattering. They don't look too great on me. And your new haircut is gorgeous! Thanks so much, Dear! I love flared jeans so much that it took me a long time to give in to the skinnies trend. Thanks so much for stopping by! It must be a wonderful feeling turning in those grades and keys – almost like finishing a marathon? You look so chic in all these outfits, but I really love the look of the flared jeans, lace cardigan and scarf. So very fab! Well, I have no idea what it's like to finish a marathon, but that would be cool! But yeah, it's a great feeling of relief! Thanks so much for stopping by, Dear. Pretty pears rock! Crochet tops are perfect for summer. Love all your looks especially the one with the hat and Seychelles sandals. And the evening look is so chic. Enjoy your break from teaching! HAHA … Sometimes I do put those little rascals inside, but they're just so happy when they're part of whatever I'm doing. They're spoiled rotten! Thanks for sharing with Visible Monday, you look fab in these summer knits! Thanks so much, sweet Patti! Loved your posts from NYC so much! Can't you go back and post more? hee. Love these crocheted tops! That black look is perfecto. I'm 5'7' … how tall are you, Jessica? Love your pretty floral dress on your blog post! Do you miss teaching? Doggie photo bombers are the cutest! I love all of your looks, but I think my favorite is number two. That crochet top is so pretty! You look gorgeous in everything! Aww, thanks, Lana. What a sweetie. All these looks are great on you. My fav is the first one. Now that I'm a FORMER teacher (retired as of Feb 2013) I don't have to be jealous about your shorter semester. In the past ten years ours has been extended and extended. We always worked until the end of June but had almost 3 weeks for exams, marking , preparing report cards and planning meetings for next year. Not to mention prepping for Commencement exercises. Now exams start on June 23 or so..and Commencement is on June 30…CRAZY! Yeah, we get out early, but then we go back to school on August 11th! Thanks for stopping by, Susan! Well, you did bring the start of summer! Love this beachy boho vibe you've shown us. And all three looks are fabulous, but that all black attire is so chic, it's a definite "take me to dinner, please" kind of outfit. I taught school for many years and I still remember the pure joy of freedom when the last bell rings. Happy summer vacation to you, cute lady. Love your style and your blog, Trina, so your compliments mean so much to me! Fabulous relaxed looks! As a TEFL teacher I know how hectic it can get towards the end of the school year…. But then you have some time to do whatever you please, no work interfering. I think that's one of the best things about being a teacher: you know what's in store at a certain time and can plan your activities accordingly. LOVE summer! Thanks so much for stopping by, Tiina! Vacation is for faculty, too! So enjoy. Looking very sophisticated with your new hair, in your vacationy togs. Each piece a winner … pretty tops, especially. Each sweater better than the previous one. I've got kind of a crush on the black one,You have your model-y moue down pat. Must have been hard to stay ethereal looking with your doggies begging for Mom-time. Adorable, all of you. Hee …. you're the sweetest Jan! So happy to be on summer break and have a bit more time to indulge my inner fashionista and my adorable photo bombers. Oh, who am I kidding .. those brats get indulged all year long! Hi, I just found your blog! You look great in every pic too. Even look great in all black which does not suit everybody. I'll be checking in now and then. Thanks so much for stopping by, Joni! I do love wearing all black, so thanks for that sweet compliment! Aww, thanks, Gina! They are so spoiled and loved! Looks like you had a lot of fun taking pics…I love it when my cats wander randomly into my pics…you doggies look so cute too 🙂 All of you outfits are cute, but I especially love the first look…very 60s!